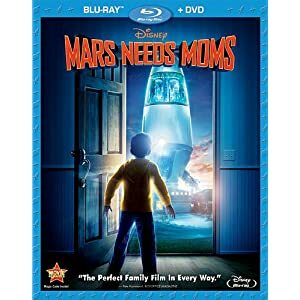 This Fall, families will not want to miss the chance to own MARS NEEDS MOMS , the story of a young boy’s intergalactic adventure to find his Martian-nabbed mother as it arrives into living rooms across the country in a Blu-ray™ Combo Pack with 3D, DVD, Movie Download and On-Demand August 9, 2011. From Disney and Academy Award®-winner Robert Zemeckis (Best Director, Forrest Gump, 1994), comes the craziest adventure in the galaxy— complete with out-of this world special effects and jam packed with bonus features, it’s a thrilling journey that’s pure fun. Uniquely packaged with families top of mind, MARS NEEDS MOMS will be available for purchase as a 4-Disc Blu-ray Combo Pack (Blu-ray 3D™ + Blu-ray 2D + DVD + Digital Copy) for the suggested retail price of $49.99 US/ $56.99 Canada; a 2-Disc Blu-ray Combo Pack (Blu-ray 2D +DVD) for $39.99 US/ $46.99 Canada; a 1-Disc DVD for $29.99 US/ $35.99 Canada; a High Definition Movie Download for the suggested retail price of $39.99 U.S./45.99 Canada; a Standard Definition Movie Download for the suggested retail price of $29.99 U.S./$35.99 Canada; and/or On-Demand (for additional information and pricing, please contact your television provider or favorite digital retailer. Bonus features are not offered with On-Demand). The Disney Blu-ray Combo Packs provide families with an enhanced entertainment experience – offering the flexibility to enjoy the film at home, in the car and on portable devices, in several platforms of choice (i.e., Blu-ray 3D , Blu-ray 2D , DVD + DigitalCopy ) and comes packaged complete with never-before-scene bonus features, including deleted scenes, a special featurette and more. To learn more, fans are invited to visit www.disney.com/marsneedsmoms. · Extended Opening - The movie begins… but wait, there’s more. See it here. · “Fun With Seth” - The cast and crew had a galaxy of fun making Mars Needs Moms, thanks to the on-set antics of Seth Green and Dan Fogler. Watch them do the ROM dance see them compete to see who can do their verbal ROM the fastest, and much more. Suggested Retail Prices: 4-Disc BD “3D” Combo Pack (Blu-ray 3D + Blu-ray 2D + DVD + Digital Copy) = $49.99 US/ $56.99 Canada; 2-Disc BD Combo Pack (Blu-ray 2D + DVD) = $39.99 US/ $46.99 Canada; 1-Disc DVD = $29.99 US/ $35.99 Canada; High Definition Movie Download = $39.99 U.S./45.99 Canada; Standard Definition Movie Download = $29.99 U.S./ $35.99 Canada; On-Demand = For additional information and pricing, please contact your television provider or favorite digital retailer. Bonus features are not offered with On-Demand. Take out the trash, eat your broccoli — who needs moms anyway? Nine-year-old Milo (Seth Green) finds out how much he needs his mom (Joan Cusack) when she's nabbed by Martians who plan to steal her mom-ness for their own young. In a race against time and oxygen, his quest to save her knows no bounds. And with some unexpected help, Milo just might find his way back to her — in more ways than one. Though some of the critics did not like this movie I have to say that I am not one of them., As a Disney fan I have to say that I thought that they did a pretty good job with the film. While it was not the best Disney film that I have ever seen, it was not the worst either. The movie itself was entertaining and the characters were fun and unique as well. I also thought that the actors did a good job with their characters. My daughters enjoyed the movie and laughed at many parts. I liked the fact that the movie had some good messages within it and tackled some hefty topics as well. Topics such as courage, friendship, political aspiration and power all get tied together into one movie, and it all seemed to fit well together. So don't let the critics scare you away from this movie. If you like Disney rent it or buy it, but definitely see it!